P.S. Буклет на арабском языке. Содержит большое количество интересных фотографий из жизни аденцев разного периода времени. P.S. Буклет на арабском языке с предисловием на английском. Фотографии йеменок в быту. Особенно интересно, что эти фотографии сделаны йеменкой - директором Дома Фольклора в Сане- Арвой Отман. Yemen: Jewel of Arabia's thorough coverage will prove indispensable to the visitor. This book, long in the making, is now the only photographic work generally available to the English-speaking visitor or armchair traveler. About the Author: Charles and Patricia Aithie lived and worked together in the Middle and Far East for more than five years travelling extensively with their cameras. They live in Wales. P.S. Вступление, оглавление, списки иллюстраций, карт и т.д. Общая информация по стране. Для широкого круга читателей. P.S. Буклет на английском и арабском языках. Описание истории крепости с небольшим количеством фотографий. Для широкого круга читателей. Until the early 1990s the southern and eastern towns of Yemen were extremely difficult to access. The result of nearly two decades of research, this is the first book to offer an in-depth investigation into the characteristic architecture of the region. The authors first hand research provides detailed insights into building techniques and methods, though still practised, are little known outside the area. Refreshingly, the book moves out of the more familiar major cities into the hinterlands and explores regions that could be said to be the last strongholds of traditional Arab architecture. The author was allowed to visit locations and sites that had previously been closed to architectural historians. As a result of this privileged access, the text and images combine to convey unique insights and viewpoints: those of the master builders and house owners who actually create and inhabit the buildings. P.S. Много фотографий, схем. Есть словарь архитектурных терминов с указанием региона, где они используются. Авторские права этой книжки перекрывают любую утечку информации :))) Книга шикарна. Paul Dresch "A History of Modern Yemen" Cambridge University Press, 2000, 304 p.
To the outside world, Yemen is famous for its beautiful landscapes and architecture. However, as Paul Dresch demonstrates, Yemens modern history is unique and deserves to be better understood. While the borders of most Middle East states were defined by colonial powers after the collapse of the Ottoman Empire, a single Yemeni state was not formed until 1990. In fact, much of Yemens twentieth-century history was taken up constructing such a state, forged after years of civil war between the North and the South. The story is a complex one, but the author handles it masterfully, employing his skills as an anthropologist to re-enact the experiences of those involved through personal encounters and a first-hand knowledge of the region. The narrative is fast-moving and interactive, introducing the non-expert painlessly and pleasurably to a little-known slice of Arab history. Conversely, the expert will find much that is new on every page. P.S. Вступление, оглавление, списки иллюстраций, карт, графиков и т.д. Carolyn Han (Retold by), Kamal Ali Al-Hegri (Translator)"From the Land of Sheba: Yemeni Folk Tales" Interlink Books, 2005, 104 p.
Rich in cultural significance, social commentary, and popular beliefs, the tales found in this series represent the best, the most intriguing, and the most curious of oral literature from cultures whose legends, myths, and folklore have been largely unavailable in English until now.Each volume includes 20 to 30 tales, accompanied by an introduction and a historical overview which give the reader compelling insights into the culture, the folk literature, and the lives of the people in the region. P.S.Милые сказки, похожие на адаптированные тексты. Eric Hansen "Motoring With Mohammed: Journeys to Yemen and the Red Sea" Houghton Mifflin, 1991, 240 p.
Ten years after being shipwrecked on a remote island off Yemen, Eric Hansen returned to search for the journals he had hastily buried during his rescue by a boat-load of smugglers blown off course. It was an unlikely mission, in an unlikely country, compounded by the island's being in a military zone. For, as Hansen discovered, Yemen is caught somewhere between the Middle Ages and our own technocratic times. It is a nation whose capital, San'a, is a collection of Babel-like medieval towers; a tribal society where arguments are settled by gun-fire, and where the majority of the male population spend their lives in a daze, chewing hallucinogenic qat-leaves. It is a country that harbours hostages, missionaries, expatriates, refugees - and Mohammed, the guide who turns Hansen's first attempt to rescue his notebooks into a sheep-buying expedition. This is Hansen's account of the mission. P.S.Описание, содержание, несколько страниц текста и т.д. (моя книжка отличается по формлению). Увлекательное повествование, но местами занудное в подробностях. "Curiosity kept me striving". Hans Helfritz in Yemen 1931-1935. A photographical and music-ethnological jorney, Sana, 2007, 138 стр. : ил. На английском, немецком и арабском языках. P.S. Издание подготовлено при поддержке немецкого посольства в Сане, музеев и архивов Германии, где хранятся фотографии, звуковые записи и рукописи Ганса Хельфрица. Описываются его путешествия по Йемену с богатым иллюстративным рядом его фоторабот, а также архивными записями. • The only up-to-date dedicated guide to Yemen on the market. • The latest information on visas, security and obtaining travel permits, plus living and working in Yemen. • Tribal culture, desert areas inhabited by nomads, Mar’ib and other archaeological sites. P.S. Вступление, оглавление, краткий исторический очерк и т.д. На данный момент лучший туристический путеводитель по Йемену. Но хромает историческая часть. This book focuses on a team of traditional builders specialized in the construction of towering mosque minarets in Sana'a with whom the author worked as a building laborer in order to learn about learning in a context in which formal technical training, engineers, and drawn plans are nonexistent. Through a combination of rich architectural and ethnographic description, this study of apprenticeship and human spatial cognition provides a fascinating insight into the daily lives and activities of a professional class of craftsmen, and investigates the unique teaching-learning processes that distinguish their trade and mould both their professional and social characters. P.S.Вступление, оглавление, списки иллюстраций, карт и т.д. P.S.Копия стр. 387-429, 45 фотографий. P.S.Копия стр. 213-244, 31 фотография. Queen of Sheba. Treasures from Ancient Yemen Edited by St. John Simpson. pp. 224, 260 colour, 50 black and white illus. London, the British Museum Press, 2002. Drawn back to the Yemen by idyllic memories of age-old cities, spectacular mountains and, most of all, the dreamy afternoons spent chewing the stimulant leaf of the qat tree, Kevin Rushby set out to travel the old trade route from the highlands of Ethiopia to Yemen. The journey is at times dangerous, often comic; and by accepting the invitation to take qat at every opportunity, he encounters a wonderful array of characters - criminals, Islamic scholars, an exorcist, and the mysterious Cedric, the travelling companion from hell who offers to help Rushby find a dhow across the Red Sea. Название говорит само за себя. Книга читается легко и приятно, согласно заданной теме. P.S. Буклет на английском и арабском языках. Краткий очерк о Сане с перечнем основных достопримечательностей. Для широкого круга читателей. [...] The book takes the reader on a geographical and historical tour through the ancient kingdoms that fringe the desert, illuminates the medieval world of the central and southern highlands, and explores the links with the wider world developed from Aden and the Hadhramawt. Superbly illustrared by Jane Taylor's phhotographs, with a foreword by Tim Mackintosh-Smith and an essay on the Indian Ocean island of Soqotra by anthropologist Miranda Morris, this book will surely inspire its readers to visit Yemen for themselves. Общая информация для широкого круга читателей. Scripta Yemenica: Исследования по Южной Аравии: Сборник научных статей в честь 60-летия М. Б. Пиотровского, Спб, 2004, 343 стр. Сборник научных статей посвящён эпиграфическим, археологическим, этнологическим, историческим исследованиям по Южной Аравии. Авторами статей являются ведущие отечественные и зарубежные сабеисты, археологи, историки, лингвисты и этнологи, специалисты по истории культуры Южной Аравии. Статьи сборника содержат публикации уникальных, ранее неизвестных южноаравийских надписей и иных письменных документов, монетных находок, обобщения и анализ новейшего археологического, этнологического, лингвистического и фольклорного материала. Некоторые статьи зарубежных авторов публикуются в переводе на русский язык, остальные — на языке оригинала. Предисловие и оглавление В принципе может быть интересна широкому кругу читателей. Одна из моих "настольных" книг. Sheikh Hassan Al Thani, Nicole de Pontcharra-Postnikowa "A Vision of Yemen" 2007, 200 p.
Sheikh Hassan Al Thani is a tireless explorer of the history of southern Arabia. A curious observer who is well acquainted with his subject, he photographs the footprints of this civilization, while pondering the country's future. This work takes the reader progressively deeper into the heart of Yemen to see fascinating landscapes, streets, architecture of ancient towns, cars, satellite dishes, and other signs of modernity. The photographer trains his lens on people who emerge from these photographs to give additional clues to understanding this remarkable and changing land. Shot in color and in black and white, these fascinating images provide unparalleled testimony to the richness of this ancient civilization. P.S. Фотоальбом. Фотография на обложке -- Моха. P.S. Буклет на английском и арабском языках. Краткий очерк о провинции Таиз с перечнем основных достопримечательностей. Для широкого круга читателей. Tourism in Democratic Yemen , 1976, 228 стр. : ил. На английском, французском, немецком и арабском языках. P.S. В Южном Йемене в 1970-е гг. существовало Public Corporation for Tourism P.D.R.Y., которое, видимо, и стало инициатором издания этого, вероятно, первого в Южном и Северном Йемене путеводителя по стране с отличными и занимательными фотографиями. Visitor's complete guide to Yemen, Arab World Tours(Bahrain)&A Type Of Magic(Canada), 2004, 224 стр+илл. Некоторые статьи из этого путеводителя (в плохом переводе на русский язык) есть на сайте Yemen-club. Yemeni costume, Ministry of Tourism. 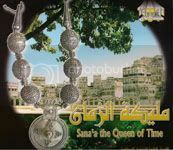 Yemen Tourism Promotion Board, б/а, б/г, 66 стр. : ил. На английском и арабском языках. P.S. Фотографии и описание старых йеменских костюмов и аксессуаров. "Сана. Принципы архитектурного градостроительства разных мусульманских эпох". Сана, Центр инженерного консультирования Аттахера, 2005. На арабском языке. 624 стр.+илл.+схемы+карты+рисунки. P.S. Великолепная книга по санской архитектуре. Библиотека mois_tas Часть 1 (А-Н).